In a rare occurrence, Christmas Eve and the first day of Hanukkah fall on the same day this year. Perhaps these two religious events coinciding is a signal that the world can be a more united place in 2017. It has been a difficult year -- the long, bitter American election seemed to further divide an already divided country, and the negativity seeped into Canada. The Brexit vote shook the European Union and the crisis in Syria shows no signs of resolution. In a rare occurrence, Christmas Eve and the first day of Hanukkah fall on the same day this year. Perhaps these two religious events coinciding is a signal that the world can be a more united place in 2017. This made me think about all the things perhaps we can do personally to ensure a more positive attitude this holiday season. Hanukkah is a festival that celebrates one day's worth of lamp oil miraculously lasting for eight days. 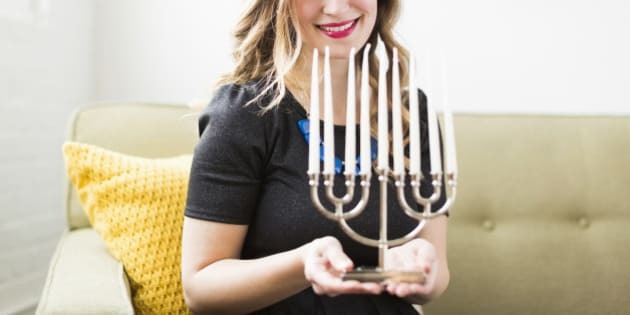 Jewish families light a menorah with eight candles, one for each night. December is the darkest time of year. Nights are long, and winter seems to stretch out ahead of us. At a time when every song on the radio and every shop window is shouting about joy, many people find this to be one of the loneliest times of the year and often making it difficult to see the light in the darkness. For me, lighting the candles on the menorah are always a reminder that small miracles can happen at this time of year. If you are feeling low perhaps reach out to a friend, go for a walk and try to stay away from all the holiday crowds. Volunteer at a food bank -- there is nothing like giving of yourself to raise your spirits and help you put your problems in perspective. There is light in almost everything if you look hard enough. Gift-giving at Christmas is a wonderful part of the holiday season. But the pressure to shop and the stress of keeping to a budget during the holidays can turn what is supposed to be a joyful time into a stressful one. This year, give yourself the gift of gratitude. Take a moment to write down all of the things that you are grateful for each night before you go to bed. Keeping an actual gratitude journal will make joy more accessible at this time of year. Give yourself the gift of realizing how much you already have and it may even inspire a different type of gift giving? This year I was giving the gift of the Headspace app and that idea came to me while I was journaling. The holidays are about people coming together. But sometimes the people closest to us can say hurtful things and differing opinions can barge their way into holiday get-togethers. This year, try to be more empathetic to the people in your life that you disagree with. Try to reserve judgment until you know all the sides of an argument. Let this year's Christmas-Hanukkah overlap remind us that we have a lot more in common than we think. If Martha Stewart and Snoop Dogg can make a dinner party work, we can spend time with our loved ones this holiday season and be happy about it. Merry Christmas, Happy Hanukkah and Happy Holidays to everyone!